A reputable home security system will be essential for individuals who are still living on their own. If they have been diagnosed with a serious illness, then they will want to make sure that they can call for medical help if needed. If they use a cane or walker to get around, then they can keep a security device fastened to their belt or wrist. If they happen to slip and fall, a quick push of the security button will have emergency medical personnel at the door in no time. Vivint can help people with their options. The Vivint Facebook page is an excellent place to start. For more information on the different options please visit Vivint’s Facebook. People who utilize wheelchairs will need an easy way to bathe. Men and women who pay a caregiver to come to the house each day may still want to have a roll-in shower built. This way, after they have been transferred into a sturdy shower chair, people can simply enter the shower area without any problems. In most cases, older bath tubs can be ripped out and replaced with a wheelchair-friendly surface without a hitch. Shelves for shampoo and conditioner bottles can also be added. For added mechanical help, men and women with disabilities can also choose to add a stair lift to the stairs themselves. This is nearly essential for people who want to remain living in a two-story structure. A stair lift will allow them to move between both levels of the residence. If their sleeping quarters are on the second floor, this will be a magnificent solution. 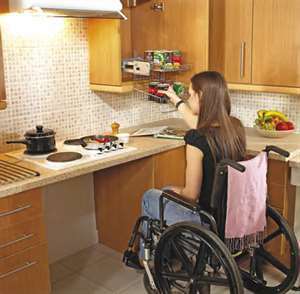 Lifts will allow older men and women to continue to enjoy their independence. Last but certainly not least, home owners should also consider converting their carpeted floors to wood floors. Wheelchairs are much easier to maneuver on solid floors. Non-carpeted surfaces are likewise easier to clean. Most hardwood floor professionals will be happy to provide a price quote before the work begins. Men and women can then decide when they would like to move forward with the conversion. Great tips for residents with disability. It’s really important to restructure the home to make it easier for them to move around. Great post and I think every home owner with disability should know this like those staying at some downtown Boston apartments. “People who are confined to wheelchairs”? My wheelchair provides liberation, not confinement. We sincerely apologize that this statement was not removed during the editing process. We agree that derogatory statements like this simply propel stigmas that are incorrect. Thank you for your comment. can also increase its overall value. Custom Cabinetry – Living Color, the world most unique custom aquarium company offers custom cabinetry, custom aquarium cabinetry, aquarium cabinets, woodmode cabinetry, custom cabinetry designs in Florida. I sincerely apologize for the editing mistake that was posted on 3/13/13. The comments do not reflect the views of the staff and leadership of this organization. From this moment on my efforts will be 1000 times better in this area. Sincerely, Bob Lujano, Jr.